"Bringing Our Missing Children Home"
We are pleased to invite all Nebraska 5th grade students to recognize National Missing Children’s Day by participating in the Nebraska 2019 Missing Children’s Day poster contest. The theme of the contest is, “Bringing Our Missing Children Home”. 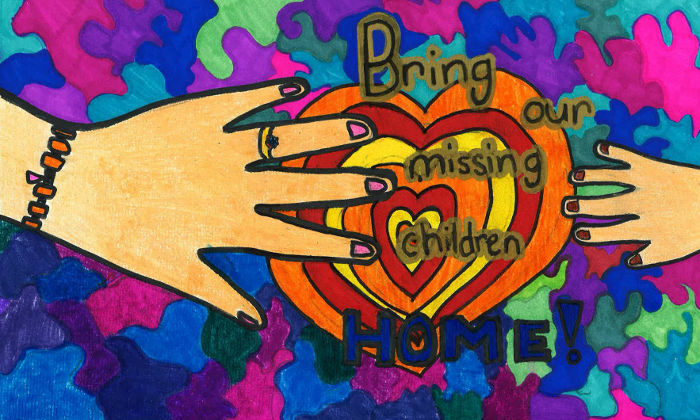 Artwork should reflect the theme “Bringing Our Missing Children Home”. This phrase must appear somewhere on the poster. The theme may be depicted in the student’s artwork through one or a combination of illustrations (e.g., signs and symbols, people, abstract, industry, wildlife) and can be created using media such as acrylics, watercolor, pencils, charcoal, magic markers, spray paint, crayons, and pastels. Digitally produced images, collages, cut-outs, and stamping will not be eligible for consideration. Complete information regarding the national poster contest can also be found at https://www.ncjtc.fvtc.edu/mcd. The U.S. Department of Justice has created a Missing Children’s Day Discussion Guide that can be used to assist your classroom instruction.